July success! Over 20,000 invasive plants removed; numerous native trees, bushes and plants saved! Starting on July 7 and continuing for an entire week, a four person NY-NJ Trail Conference Invasive Strike Force Conservation Corps Crew collaborated with a nine member Excelsior Conservation Corps along with a dedicated band of volunteers and neighbors to continue the ongoing quest of the Friends to remove invasive plants from the northernmost section of the trail. The 20,000 plus invasive plants removed will no longer be impeding views, threatening historic stone walls or choking out the valuable native plants and trees that support local wildlife. 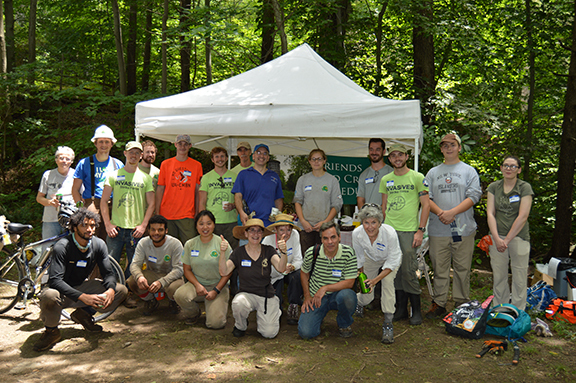 During the week this intrepid group of dedicated crew members worked in the rain and in the heat, beginning on the northernmost intersection of the trail with Quaker Bridge Road and ending two and a half miles south at Fowler Avenue in Ossining, and removed well over 20,000 individual invasive plants. The Excelsior Crew worked for a total of six days and the Invasive Strike force worked for four days, covering a seven day period. The Friends put the crews up in the cabins at nearby Croton Point Park, an arrangement which worked out extremely well. The weeklong project started on a rainy day under a white canopy donated by Friends board member Daniel Shure. The rain did not stop our stalwart group of young people who began the day with their communal stretching exercises. The crews were trained on species identification, broke up into species specific teams and got to work. The moist soil made it easier to pull up the plants by their roots. That first day they documented their work and removed 4,000 invasive plants with great spirit and enthusiasm, not daunted by the rain and dirty faces and clothes that resulted! The second day over 10,000 invasive plants (ten different species) were removed by the crews working in tandem with a dozen volunteers. What was particularly special and gratifying was that two of the volunteers who participated were neighbors whose properties border the trail. And Steve Oakes, our Park Manager, came to help and to offer encouragement. During the week the Excelsior Crew brought their power tools, their hand saws, donned their helmets and cut down numerous invasive small trees and large bushes too large to pull up by the roots, placing yellow flags on the stumps as they went. The Strike Force Crew followed with judicious applications of herbicide; those bushes will most definitely not grow back. Although the majority of bushes cut down and flagged were giant Burning Bush (Euonymus alatus), we also removed two species of invasive viburnum bushes that have become increasingly prevalent on the trail in recent years, Linden Viburnum (Viburnum dilatatum) and Siebold’s Viburnum (Viburnum sieboldii) along with some Border Privet (Ligustrum obtusifolium), Asian bush honeysuckle and one specimen of invasive Oriental Photinia (Photinia villosa) with seeds getting ready to propagate. The Excelsior Crew members also specialized in using their pick mattocks to remove numerous Japanese Barberry (Berberis thunbergii) and Multiflora Rose (Rosa multiflora) bushes. These bushes had re-sprouted, appearing to be small bushes but turned out to have extensive root systems. They had been huge bushes that were cut down two years ago by SavATree during the 2016 I Love My Park Day (ILMPD) (see http://aqueduct.org/news/i-love-my-park-day-2017-report), but had not been treated with herbicide. So now they were of manageable size for the Excelsior Crew to tackle, and tackle them they did! Hundreds! The Strike Force Crew, besides applying herbicide to the cut stumps, also participated in the removal efforts, concentrating on some newly emerging species such as Winter Creeper (Euonymus fortunei) and spotting some shoots of Japanese Knotweed (Reynoutria japonica) and Tree of Heaven (Ailanthus altissima), which would spread rapidly if not quickly controlled. They also removed an entire hillside of English Ivy, braving yellow jackets to do so. Both crews did extensive hand pulling to deal with Wineberry (Rubus phoenicolasius), Oriental Bittersweet (Celastrus orbiculatus), Japanese Barberry (Berberis thunbergii), Japanese Maple (Acer palmatum) and Porcelain Berry (Ampelopsis brevipedunculata) growing along the trail. They also dealt with the tedious task of removing numerous small seedlings of Euonymus bushes which had sprouted beneath the huge bushes now removed. Toward the end of the week the Wineberries started to become ripe and the crews had the opportunity to nibble the ripe berries. They discovered some growing by their cabins at Croton Point Park and helped reduce the supply of berries there by eating them. Building on the work done on ILMPD, the crews removed all of the visible invasive species from above and below the 93 feet of the stone wall that was restored on May 6. The stone wall now stands out as a beautiful monument to the original builders. Working with guidance from our mentoring organization, the Lower Hudson Partnership for Regional Invasive Species Management (PRISM), www.lhprism.org, the crews participated in an experiment to control Lesser Celandine (Ficaria verna) by smothering. On ILMPD we dumped our many bags of invasive Garlic Mustard (Alliaria petiolata) on top of the Lesser Celandine, and then covered the piles with black plastic, most definitely unsightly. Our good friend Guy Pardee, who worked as a crew leader on ILMPD, responding to a last minute request, dumped a load of wood chips on the trail just in time for the Excelsior Crew to use to cover up the ugly black plastic. At some point in the future we will remove the plastic and see if we have been successful in killing the Lesser Celandine. If we have, we can plant some native plants there. On that last day of the Excelsior Crew’s time with us, one more volunteer came to assist; she carted the vines removed by the Crew off to the side of the trail for future mowing and chipping by the Aqueduct Parks Crew. And then she offered to buy lunch for the crew, took special orders and made the delivery. A great morale boost for the crew on their last day. Thanks Donna! Steven Oakes provided the inspiration to give the Crews some background and insight into the history and architecture of the Aqueduct. At the end of the hottest day of their toil on the trail, we brought them to the Weir at Ossining and Friends member and guide par excellence Sara Kelsey gave them a private tour. And on their final day of the Excelsior Crew’s stay with us they were treated to a visit to the Croton Dam. Some sections of the trail are now almost completely free of invasive plants, since some of the areas on which we worked have been the focus of six years of annual ILMPD volunteer events. Our continued long term management strategy is paying off. Other areas are now much less invaded, and with the removal of large bushes, the seeds (not that nutritious) will no longer be eaten and spread by the birds. We particularly focused on areas where native bushes are growing, removing entangling vines from native Spice Bush (Lindera benzoin), American Witch Hazel (Hamamelis virginiana), Black Haw Viburnum (Viburnum Prunifolium) and Carolina Silverbelle (Halesia Carolina) trees. We invite trail walkers to hike the trail and see what was accomplished. Walking south of the Croton Dam you will see healthy trees freed from covers of invasive vines. Marvel at the historic stone walls now visible and try to identify those that have been repaired and restored. Enjoy hillsides dotted by Christmas ferns, thriving now that they are no longer being choked out by invasive vines, plants and bushes. See if you can identify the Spice bushes that form gorgeous red berries later in the season, the Witch hazel bushes which arch gracefully over the trail and the small Black Haw and Silverbelle trees which have showy blossoms in May and June respectively. Compare these areas with the sections we deliberately avoided as being way too invaded for us to tackle, at least for the moment. Perhaps next time…. Special thanks to Board member Elisa Zazzera who designed the flyer advertising the volunteer day and to Friends member Jean Horkans who translated the flyer into Spanish. Also much appreciation is due to Linda Rohleder of the NY-NJ Trail Conference who provided guidance and mentoring as I planned this undertaking. Also to Friends member Daria Gregg who wrote the informational training manual provided to the crew members to assist them in identifying the invasive species and who collaborated with me in planning and carrying out this project. Thanks to Steve Oakes, our Historic Site Park Manager for providing advice and logistical support and for arranging for the follow up work that will be needed to mulch and chip the piles of debris we left on the sides of the trail. Also thanks to Spencer Barrett, Crew Leader of the Strike Force and to Andy Damon, Crew Leader of the Excelsior Crew who helped plan the week’s work, each of them walking the trail with me in advance to scope out the project and to think through the strategy for coordinating and carrying it out. Their leadership during the week greatly contributed to the success we achieved. And finally, a giant thank you to the volunteers and crew members who worked through rain and heat, dedicated to making substantial improvements to our beloved trail, evidencing fortitude, initiative and determination with great team spirit. We encourage other trail lovers to consider adopting a section of the trail for invasive removal and restoration. Although it cannot be done overnight, support and consultation are available along with resources. I would be pleased to consult with any group or individual wishing to take on a section of the trail for intervention. We also encourage donations to help defray the costs ($4,226) that the Friends incurred for this project which included renting the cabins for the crews at Croton Point Park and engaging the services of the Invasive Strike Force Crew. To donate, go to http://aqueduct.org/store/donations and select Invasives removal.